동화사 금당암의 극락전 앞에 동·서로 서 있는 2기의 석탑으로, 두 탑 모두 2단의 기단(基壇)위에 3층의 탑신(塔身)을 세운 모습이다. 먼저 동쪽의 탑은 2단의 기단 대부분이 나중에 보수된 것이라서 돌을 다룬 수법과 끝맺음 처리 부분에서 조화를 잃어버리고 있다. 위층 기단의 각 면에는 가운데와 모서리에 기둥 모양을 새겼다. 탑신의 몸돌과 지붕돌을 각각 따로 새겨 쌓아 올렸으며, 각 몸돌에는 모서리마다 기둥 모양의 조각을 두었을 뿐 다른 장식은 없다. 지붕돌은 밑면의 받침이 4단씩 새겨져 있다. 꼭대기에는 머리장식으로 노반(露盤:머리장식받침), 복발(覆鉢:엎어놓은 그릇모양의 장식), 앙화(仰花:솟은 연꽃모양의 장식), 보주(寶珠:연꽃봉오리모양의 장식)가 차례로 올려져 있다. 서탑은 위층 기단의 두 면에 가운데에만 기둥 모양을 새기고, 반대쪽 면의 기둥 사잇돌을 밀어넣어 그 돌로 모서리기둥을 삼았다. 탑신부의 각 층 몸돌과 지붕돌은 각각 한 돌로 이루어져 있으며, 몸돌은 모서리마다 기둥을 본 뜬 조각을 두었다. 지붕돌은 밑면의 받침이 4단씩이다. 꼭대기에는 머리장식을 받치던 네모난 돌만 남아 있고, 그 위로 머리장식부의 무게중심을 지탱하던 쇠꼬챙이가 솟아 있다. 1957년에 탑을 해체하여 복원하였는데, 그 속에서 조그만 탑 99개와 부처님의 사리를 담아두는 장치가 나왔다. 이 두 탑은 부분적으로 없어진 머리장식을 빼고는 조각의 양식이나 끝맺음 수법이 서로 비슷하고, 균형 또한 잘 이루어져 경쾌한 느낌을 준다. 기단과 탑신, 그리고 머리장식부의 세부적인 양식에서 통일신라시대 후기의 전형적인 탑의 모습을 보여주고 있다. 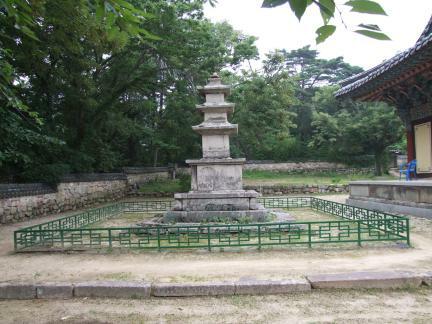 These two pagodas stand at both sides of Geungnakjeon Hall, the main hall of Geumdangam Hermitage which is a branch temple of the Donghwasa Temple. The body and the roof of each story of the eastern pagoda lost their balance and harmony due to a repair work performed later. The corner shafts of each story provide only visual support for, like the four-stepped cornices and rafters of each roof that are carved into the stone. The roof stones have little holes at each corner to hang wind bells. The ornamental top portion consists of the lowest part, the over-turned bowls, lotus petals and the sacred jewel, serially from the bottom to the very top of the entire structure. 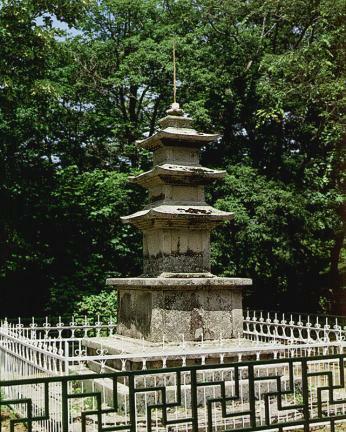 Though very similar to the eastern pagoda, the western pagoda has a two-tiered base. Like its counterpart in the east, each story and roof are made of a single stone and the corner and center pillars are carved on the base without adding any more decoration. 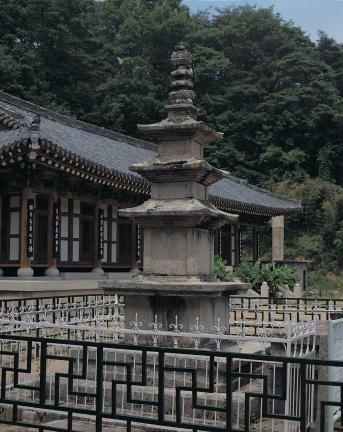 Each roof stone has four-stepped cornices. 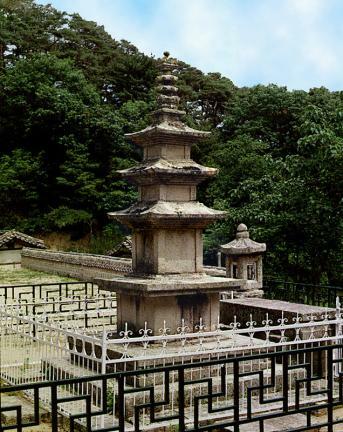 A reliquary and 99 miniature pagodas were discovered during a repair work performed in 1957. 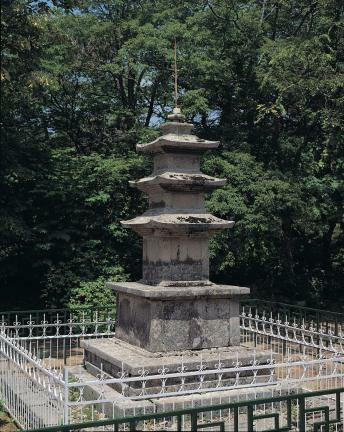 For the finial, only the bottom part still remains along with an iron rod standing upright. 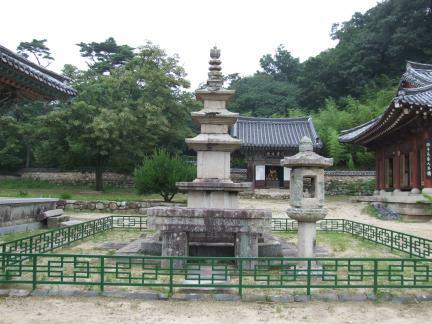 Exhibiting the same skills of masonry, these two pagodas are outstanding works of the late United Silla Period in the 9th century.